Gavin Blair visits Awaji Island in Hyogo Prefecture and speaks with the president of Keigado, one company in a fifteen-strong incense-making cooperative whose products are winning favor overseas. 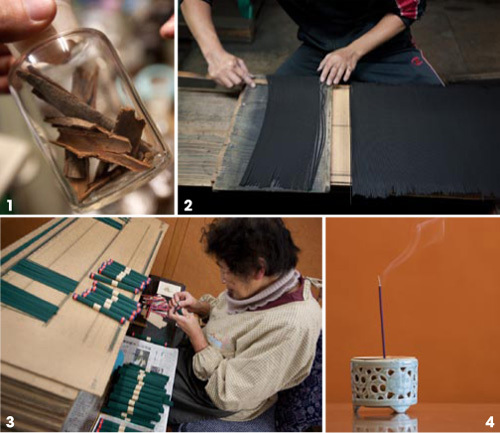 The story of incense on Awaji Island, where 70% of Japan's production of the fragrances is now centered, turns on two episodes: one that occurred 160 years ago, and another nearly 1,600 years ago. According to one of the earliest written records of Japanese history, in the sixth century a huge log of agar wood was washed up on the shore of Awaji Island. Using some of the log as firewood, the local villagers were surprised to find a pleasant aroma drifting across the island. The log was then presented to Prince Shotoku, who after having a statue fashioned from it, told the villagers to enshrine the remaining wood. 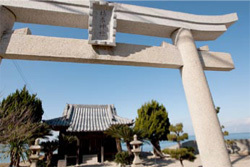 The result was the picturesque Kareki Shrine which still sits on the shoreline near the port of Ei. In 1850, a trader from Ei saw the potential of the incense manufacturing techniques which had developed across the water on the mainland near Osaka. "The strong west winds that blow on this side of the island are also ideally suited to drying out the incense," explains Shigeaki Miyawaki, president of Keigado, a company with a history of over two centuries. With the port providing the means to import raw materials and ship the finished product, the industry thrived in the town. Over the years, trade associations were formed, and accreditation for koh-shi, or incense master, was established. Sixteen local incense-manufacturing companies, each headed by a koh-shi, got together in 2005 to cooperate in promoting and marketing their products, particularly outside of Japan. 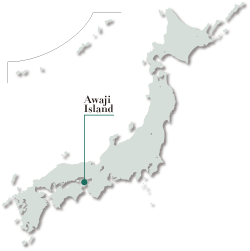 The so-called Awaji Island Koh-shis have been taking their traditional incense to Europe and the United States. The process has been one of trial and error, according to Miyawaki, himself a koh-shi. "The first boxes of incense we took to sell in France had designs that were targeted at European customers; we even put some French wording on them," recalls Miyawaki. "But then a lot of people told us that traditional Japanese designs would be more appealing in Europe." "Incense is not the kind of product that there is suddenly going to be a boom in; it takes time for people to get familiar with and come to like it," says Miyawaki. Scents including the traditional natural fragrant trees and more unexpected variations such as green tea and coffee. The different incenses have gained popularity in numerous countries, according to Miyawaki. The current collection consists of fifteen varieties of aroma, one from each koh-shi—one company has left the association—based on the theme of the four seasons. The koh-shi, a position usually passed from father to son, oversees creation of the incense at their company from start to finish, and takes responsibility for each stage as well as the final fragrance. "The aroma of incense depends on the natural ingredients, which themselves vary according to that year's weather and other conditions. Adjusting the ingredients and their balance to maintain our own distinctive incense's smell is the most challenging aspect of a koh-shi's work," explains Miyawaki. In total, each koh-shi has around 100 varieties of incense at their disposal, though a limited number will be in production at any one time. Traditional Japanese incense also has deep links to the spiritual aspects of Buddhism through the kodo incense ceremony, something that sets it apart from that made in other countries, suggests Miyawaki. Recent years have seen the koh-shis develop incense that gives off less smoke, to make their use in apartments and smaller houses more comfortable. Last year, they released a series of incense that doesn't require burning to give off their distinctive fragrance. These small packets, created using kimono material from Kyoto, can be hung in cars, on computers, or even mobile phones; truly incense for the twenty-first century.